CAA has added four new podcasts to its growing series of audio recordings devoted to professional-development topics for artists. In “Artistic Budgeting,” Elaine Grogan Luttrull, a certified public accountant and the founding owner of Minerva Financial Arts, outlines five basics steps to help individual artists with managing their finances. She also provides a PDF of an example budget for reference as you listen to the podcast. “The Artist as Administrator,” presented by Thomas Berding, associate professor of studio art at Michigan State University, explores various issues artists may consider when pondering and operating within administrative roles, including how administrative assignments can both borrow from and complement one’s studio activity. Edwin Torres, associate director for the Rockefeller Foundation’s New York City Opportunities Fund, talks about “Innovations in Fundraising,” sharing fresh models that artists have developed to create new works. Finally, the artist and professor Amy Broderick presents “The Importance of Mentorship and Advocacy,” a podcast on how mentoring and advocacy can enhance the career of professionals in the visual arts. Evolving from the National Professional-Development Workshops and now produced in tandem with them, the podcast series is ongoing, with new audio added on a regular basis. While the initial focus is on artists, CAA hopes to develop podcasts for art historians, curators, nonprofit art professionals, and other constituencies in the future. The 2012 Annual Conference in Los Angeles boasted an incredibly diverse array of sessions. Audio recordings for eighty-three of the panels—including “Picturing Urban Space in Central Europe since 1839,” “Oleg Grabar’s Impact on the Practice and History of Art,” and the two-part “Mobile Art: The Aesthetics of Mobile Network Culture in Place Making”—are now available for sale. A set of MP3 audio recordings from the Los Angeles conference is available for $199.95 as a DVD-ROM. Individual sessions, available only as downloads, are $24.95 each. Please visit Conference Media to view the list of sessions and to order. Whether you took part in, attended, or missed a particular conference session, these recordings are a must-have for your library, research, or teaching. Listen to them while walking across campus, while driving in your car or using public transportation, or while relaxing in your home. 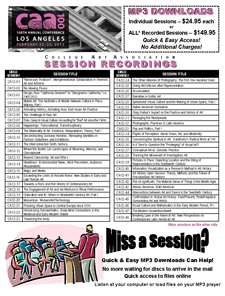 In addition to the Los Angeles sessions, you can also purchase recordings from the past six conferences: New York (2011), Chicago (2010), Los Angeles (2009), Dallas–Fort Worth (2008), New York (2007), and Boston (2006). See CAA’s Conference Audio section or visit Conference Media for details.